The Sixty-ninth United States Congress was a meeting of the legislative branch of the United States federal government, consisting of the United States Senate and the United States House of Representatives. It met in Washington, D.C. from March 4, 1925, to March 4, 1927, during the third and fourth years of Calvin Coolidge's presidency. The apportionment of seats in the House of Representatives was based on the Thirteenth Decennial Census of the United States in 1910. Both chambers had a Republican majority. A special session of the Senate was called by President Coolidge on February 14, 1925. Impeachment of Judge George W. English — On April 1, 1926, the House of Representatives impeached Judge George W. English of the United States District Court for the Eastern District of Illinois. Both Houses adjourned on July 3, 1926, with the Senate scheduled to reconvene on November 10, 1926, as a Court of Impeachment. English resigned before the impeachment trial began. The Senate met as planned on November 10, 1926, to adjourn the court of impeachment sine die. On December 13, 1926, the Senate, acting on advice from the House managers of the impeachment, formally dismissed all charges against Judge English. January 17, 1927: U.S. Supreme Court held (McGrain v. Daugherty) that Congress has the power to compel witness and testimony. Senators were elected every two years, with one-third beginning new six-year terms with each Congress. Preceding the names in the list below are Senate class numbers, which indicate the cycle of their election. 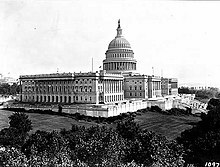 In this Congress, Class 1 meant their term began in the last Congress, facing re-election in 1928; Class 2 meant their term began with this Congress, facing re-election in 1930; and Class 3 meant their term ended with this Congress, facing re-election in 1926. (3) Albert B. Cummins (R) Died July 30, 1926. ^ Frank L. Smith (R-IL) was elected to the Senate for the term starting March 4, 1927, and when McKinley died he was appointed to finish McKinley's term. The Senate refused to qualify him due to charges of corruption concerning his election. He would later resign. See http://bioguide.congress.gov/scripts/biodisplay.pl?index=S000534. Official Congressional Directory for the 69th Congress, 1st Session. Official Congressional Directory for the 69th Congress, 1st Session (Revision). Official Congressional Directory for the 69th Congress, 2nd Session. Official Congressional Directory for the 69th Congress, 2nd Session (Revision).